Talen, I drove past the Singha figures just last week. They are indeed striking. 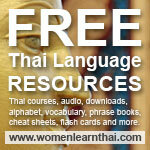 .-= Catherine´s last blog ..Thai Language Thai Culture: Telling Tails – Thai Ending Particles =-. Talen a nice montage. I always enjoy looking at your photographs. I personally really like the main picture-shows the relationship between Hinduism and Buddhism. Very appropriate. .-= Mike´s last blog ..Naga Buddhist Temple Guardian Photo/Image =-. Cat, the first time I had passed them I almost walked into one of the figures and said “excuse me”. I wasn’t paying attention and didn’t realize they weren’t real. Thanks Mike, I really liked that statue of Ganesh…it really stands out against the streets of Bangkok. In Bangkok, I’m too busy making sure I don’t fall into holes or trip over something, so I’m sure to do the same. .-= malcolm´s last blog ..FLOWERS and MORE FLOWERS and MANGOS =-. The picture of the wall covered with posters (Thailand-pictures-31.jpg) looks awfully familiar. Any chance you took that picture on a side Soi just off of Second Road ? My wife likes to go to the Boat Bakery on Second Road for breakfast. We park just around the corner and I swear I have seen that wall. The sweet sticky rice wrapped in Banana leaves (Thailand-pictures-14.jpg) should be called Thai Snickers. They sure hit the spot when I am “entertaining” the relatives in Nakhon Sawan and “not going anywhere for a while”. I used to love Snickers. I don’t eat many sweets, but when I’m in the UK I used to have a small snickers bar because they produce the best ever. I believe it has something to do with their milk? Devon cream? Not sure, but their caramel is richer, creamier, fresher. Except for popcorn. Nothing replaces a good bowl of popcorn. Local peanuts in a shell come close, but are too filling. Chuck, The wall with posters on it is on Soi Bukaow right at the curve before you get to the Tuesday.Thursday Market…you can get to second road right quickly from there so it very well could be the wall. The Sweet sticky rice is my downfall….Mama makes a large plate as soon as I hit town. Cat…you just reminded me of Thai popcorn that you get at the movies…mmmm, puts regular popcorn to shame. And don’t forget the cotton candy in sweet pancakes… it puts western cc to shame. Totally. Your photos have just made me look up to my suitcase gathering dust on top of my wardrobe. Soon it’ll be time to clean it up and head back to Thailand. The papaya’s remind me of our village garden and the children on the beach of Pattaya. Both are places I’ll be visiting soon. The Ganesh photo reminds me of Kanchanaburi. Let me explain. The top tier of the Erawan Seven Tier Waterfall has a rock formation that resembles an elephants head. I never made it to the top but what great memories. Marvellous photos and a reminder to me that all my hard work has some reward at its end. .-= Martyn´s last blog ..Red Red Whine =-. Catherine you reminded me of the first time I had those pancakes. One of my first visits to my wife’s hometown happened to fall on my birthday. She decided to have a party for me at one of her rice farming in-laws homes and hired some entertainment for the occasion. The entertainment consisted of several dancers, singers, and a DJ. They set up a sizeable stage, complete with lights and towering speakers, in the communal area surrounded by five or six farmers homes. A little while after dark I noticed the road near the in-laws home was filled with people who had come from who knows where to watch the show. Soon after that a few food carts showed up to take advantage of the plethora of consumers. One of these carts sold a rolled crepe like product filled with whatever you wanted. This cart seemed particularly busy so I went to check it out. One of the kids ordered the “pancakes” filled with cotton candy. It looked tasty so I did the same. I have to say it was interesting. Kind of like eating fiberglass insulation. Very sweet and quite delicious though so I quickly got over any issues I had with the texture. Talen I have always found the movie experience in Thailand to be far superior to that of America. I could not have described the texture better! It is the richness of the flavour that keeps me going back. Not that I eat a lot of what I buy (most goes into the bin) but the taste has a smoky, burnt caramel hint that grabs my attention. Cotton candy in the west is bland sugar. This is so much more. Martyn, I too am looking forward with the reward at the end…unfortunately it will be a bit longer before I am back…was hoping to make Songkran.